Ian Loughnane of Kingspan Timber Solutions weighs up the relative merits of structural insulated panels (SIPs) and timber frame structures. Despite them often being confused, there are quite a lot of differences between a SIPs and a timber frame structure. 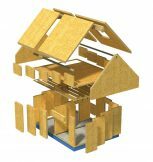 A timber frame supports loads via regularly spaced studs, whereas a SIPs panel supports loads via the facing aminate, which is restrained from buckling by its bond to the internal insulation core. So for a SIP, the nature of the insulation in the core, its bond to the external laminate and the type of laminate used all combine to determine the structural characteristics of the panel as opposed to timber frame, where the stud centres and stud size are the key drivers. SIPs structures do use timber studs, but generally only to support significant point loads generated by purlins, for example. From a buyer’s viewpoint, a timber frame can be bought with or without any thermal properties, but a SIP always has thermal properties built in. Common thermal core types are XPS, PUR or PIR. The XPS versions will be thicker than the PIR/PUR versions for the same thermal performance because XPS doesn’t perform as well as PIR/PUR. There are two main forms of manufacture: liquid core injection and adhesive bonding. Liquid core injection involves either a static hydraulic press or a rolling press. 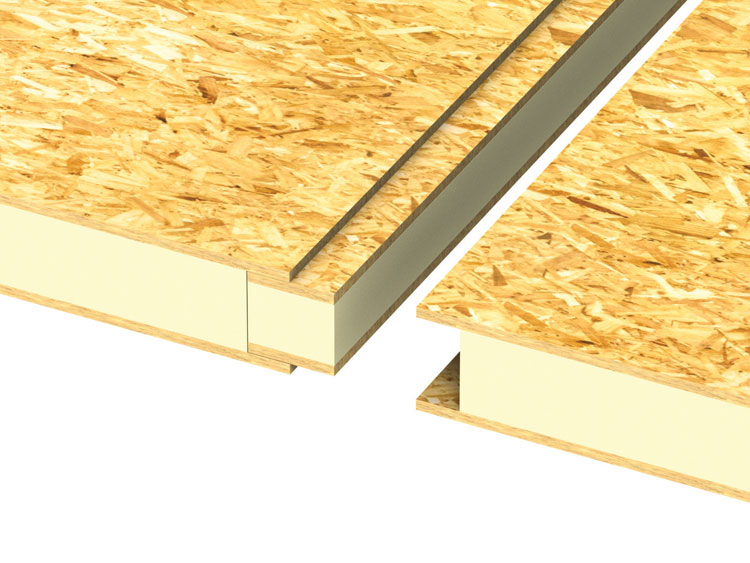 In each case the top and bottom laminate is held in place by spacers between and pressure externally. The liquid insulation is injected and expands to fill the gap between the sheets. The liquid core chemically bonds to the sheets. The adhesive method applies structural adhesive to the core and laminates in controlled conditions. The three elements are then assembled and pressed to create the panel. In both methods quality control of the chemicals/adhesives and the factory conditions/processes are important to the quality of the finished panel. SIPs behave as a composite structure and are surprisingly strong. It is not unusual to have certified performance equivalent to a building four storeys high. SIPs behaviour in fire is determined by the core and laminate reaction to fire. 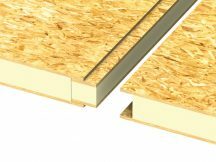 One manufacturer, for example, uses a PUR core and 15 mm OSB3 laminates which achieves 60 REI with one layer of 12.5 mm Type F plasterboard. So sourcing a good fire rating isn’t a problem. The other key difference is how the structure is constructed on site. SIPs are usually jointed with a “spline” which fits into a groove around the panel. These splines are usually a thinner version of the main panel and thereby continue the insulation integrity through the joint. This jointing method means that in general SIPs structures have much less thermal bridging than a timber frame. The use of a spline joint also allows the joint to be sealed with foam or silicone resulting in a highly airtight structure. As overall thermal performance is driven by U-values influenced by core type and bridging fraction, Psi values and airtight- ness, it can be seen that the thermal performance of SIPs panels potentially score well on all three counts. Most systems range from below 0.2 W/m2K down to 0.1 W/m2K. Compared to masonry all this performance is achieved within a relatively slim profile. Indeed, SIPs systems have always been significantly ahead of the game in thermal performance. It’s only now that regulations are becoming tighter that we are seeing larger builders seriously look at SIPs as a possible building method. Developers can gain significant advantage from high performance wall systems like SIPs. Firstly, there is the opportunity to maintain the wall thick- nesses (and therefore the site plotting flexibility and room sizes) defined by their “standard range” of house designs. 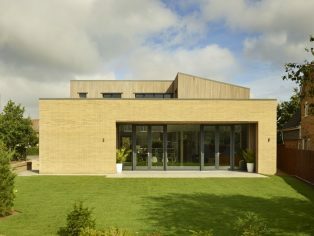 Secondly, this could also build in some SAP headroom allowing greater trade off with slab, roof or window specification. Thirdly, these systems can facilitate some future-proofing against further development of Part L, in addition to much faster build times and the associated better ‘cash cycle’. SIPs systems are very suitable for room in roof designs as an alternative to the various prefabricated roof systems that are now used extensively by builders. SIPs roofs can be used on timber frame walls or even masonry, but the build must be accurate. As with any prefabricated system, lack of fit problems can only be avoided by building to good tolerances. Once fitted, the roof facilitates the early achievement of weather tightness and avoids the complex task of site insulating and ventilating traditionally constructed roofs. For Passivhaus standards, SIPs is an ideal solution due to its inherent air tightness. Passive houses require an in service airtightness of less than 0.6 air changes per hour at 50 pascals in combination with U-values between 0.09 and 0.13 W/m2K. SIPs can also be used as a very efficient replacement for traditional “Metsec and insulation” solutions for cladding steel and RC frame structures. As a cladding solution there are significant advantages. With the right choice of laminate a SIP can offer complete flexibility of fixing position, thereby dispensing with the risks of co-ordination and tolerance. With the right choice of core the thermal performance required will be achieved with a thinner wall profile. That means more internal space for a given footprint which in the rental sector has real value. Due to its speed, the contractor achieves that all important weathertight date earlier, and therefore can improve programmes, reduce prelims and give the client an earlier handover. In city developments the financial impact can be very significant indeed. There are many choices of SIP system in the UK. By understanding the product and how it performs, SIPs can offer real benefits to the builder and developer alike. Ian Loughnane is business unit director at Kingspan Timber Solutions.